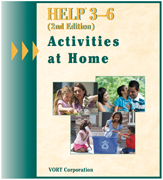 HELP 3-6 (2nd Edition) is a comprehensive, on-going, curriculum-based assessment for use with young children and their families. HELP 3-6 complements and extends the skills of HELP 0-3. 585 developmental skills and behaviors provide a comprehensive framework for ongoing assessment, planning and tracking progress. HELP 3-6 domains include Cognitive, Language, Gross Motor, Fine Motor, Social-Emotional, and Self-Help. Supports Federal Requirements for Part B of IDEA and Head Start programs. HELP 3-6 domains and Strands are aligned with Head Start domains and school readiness goals. HELP 3-6 products are cross-referenced by skill ID #'s for easy linking between materials. 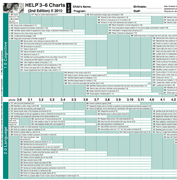 HELP 3-6 Assessment Manual , HELP 3-6 Assessment Strands , HELP 3-6 Activities at Home.